Dirty Dog Dryland Race this weekend at Pearson camp. It’s the lucky 13th year for the Dirty Dog Dryland Race at MaKaJaWan Boy Scout Reservation in Pearson. The races are this weekend, starting at 8 a.m. Saturday and Sunday and concluding each day by about 2:30 p.m. There is no fee for parking or admittance and spectators are welcome. Please leave pets at home unless they will be participating in the canifun run/walk. Right from the beginning organizers of the event realized how lucky they are to have property owners willing to support this popular fall event for dog powered sports, noting that the event is a perfect fit for Langlade County’s slogan “The County of Trails”. 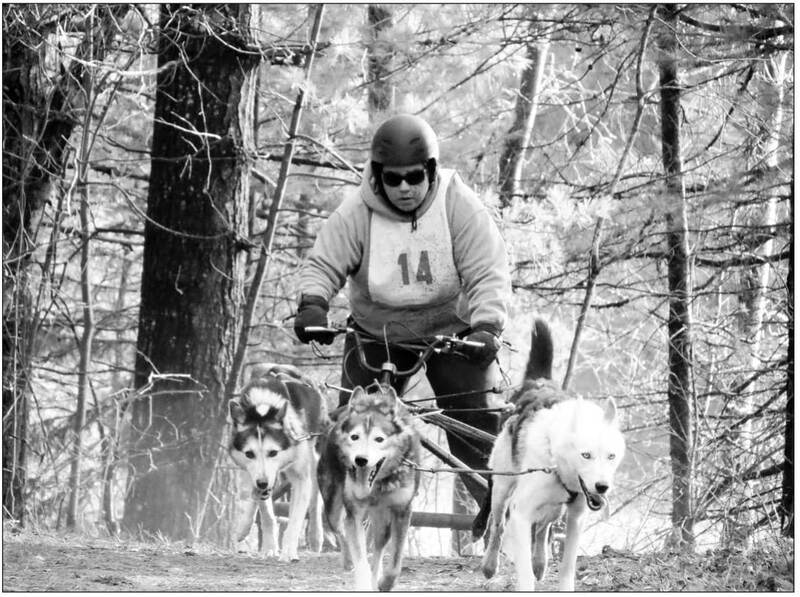 Many of the racers participating in the Dirty Dog also came to Langlade County at other times to train and condition their dogs on the trails designated for sled dog teams by the Langlade County Forestry and Recreation Department. Jamie Van de Walle and her daughter Riley bring their dogs from Peshtigo. in the trail at a recent Dirty Dog Dryland Derby race in Pearson. Northern Breed Class at the 13th Annual Dirty Dog this weekend. Langlade County plays an important role at The Dirty Dog Diner, too. The most frequently purchased item from the home cooked menu are Langlade County baked potatoes served with all the trimmings. After the last race on Saturday afternoon, there will be a Cani-fun run/walk. This is a free, non-competitive class for the whole family. Dog powered sports dryland races mean a three or four-wheeled cart, a bike or a scooter is substituted for a snow sled. Additionally for the canicross class the musher runs with a dog pulling them “gently” in harness. “In dryland events the human athlete works as hard as their canine,” Castaldi said. “Dogs are just as enthusiastic doing a dryland race as they are running a packed snow trail. Since dryland races are relatively short, mushers have time to talk with spectators. Many of the dogs beg for petting from spectators, too. Visitors to the dryland race will different breeds of dogs eager to run down the trail."